While interest in the relations of power and identity in food explodes, a hesitancy remains about calling these racial. What difference does race make in the fields where food is grown, the places it is sold and the manner in which it is eaten? How do we understand farming and provisioning, tasting and picking, eating and being eaten, hunger and gardening better by paying attention to race? 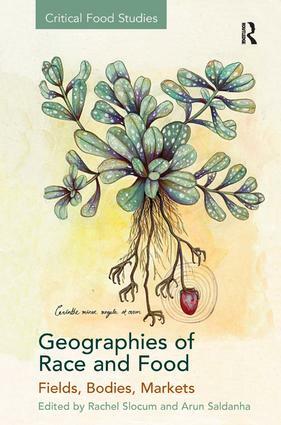 This collection argues there is an unacknowledged racial dimension to the production and consumption of food under globalization. Building on case studies from across the world, it advances the conceptualization of race by emphasizing embodiment, circulation and materiality, while adding to food advocacy an antiracist perspective it often lacks. Within the three socio-physical spatialities of food - fields, bodies and markets - the collection reveals how race and food are intricately linked. An international and multidisciplinary team of scholars complements each other to shed light on how human groups become entrenched in myriad hierarchies through food, at scales from the dining room and market stall to the slave trade and empire. Following foodways as they constitute racial formations in often surprising ways, the chapters achieve a novel approach to the process of race as one that cannot be reduced to biology, culture or capitalism. Rachel Slocum is Assistant Professor in the Geography and Earth Science Department at the University of Wisconsin, La Crosse. USA, Arun Saldanha is Senior Lecturer at the Lancaster Environment Centre, Lancaster University, UK. The study of food has seldom been more pressing or prescient. From the intensifying globalization of food, a world-wide food crisis and the continuing inequalities of its production and consumption, to food's exploding media presence, and its growing re-connections to places and people through 'alternative food movements', this series promotes critical explorations of contemporary food cultures and politics. Building on previous but disparate scholarship, its overall aims are to develop innovative and theoretical lenses and empirical material in order to contribute to - but also begin to more fully delineate - the confines and confluences of an agenda of critical food research and writing. Of particular concern are original theoretical and empirical treatments of the materialisations of food politics, meanings and representations, the shifting political economies and ecologies of food production and consumption and the growing transgressions between alternative and corporatist food networks.